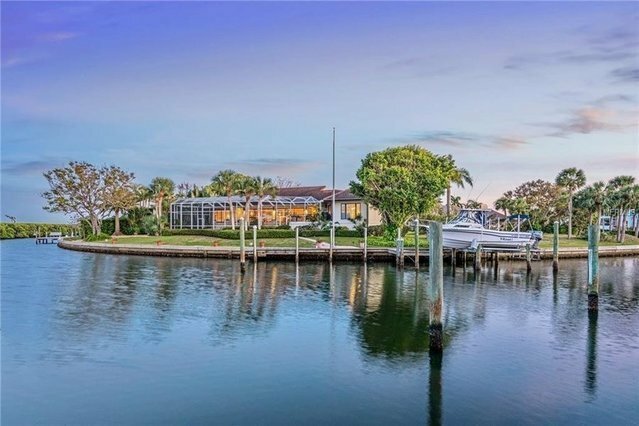 A PRIVATE WATERFRONT OASIS offers open and tranquil bayou and bay views. Unwind with your guests in the spacious lanai with oversized heated pool and spa.Your solitude will only be interrupted by an occasional visitation from a passing manatee. Slip away from your private dock for a boating adventure on Bay/Gulf or catch dinner from your 194-foot seawall. Remember there is deeded access to private beach on the Gulf. 18-inch porcelain tile underlay the great room, the updated chef's kitchen and high traffic areas. There are three generous bedrooms (split plan) with plans for a fourth. All bathrooms are updated.Open the numerous sliders for wonderful cross breezes and enchanting views. Custom wood touches make this home very warm and welcoming. St. Armands Circle is three miles away while Longboat Key Club membership affords you golf, tennis, social activities and more...to round out your Florida lifestyle.